The fourth entry in our five-part series on helping you decide when it’s time to replace your mattress deals with the impact a mattress can have on your allergies. As unpleasant as it may be to consider, a mattress can become an ecosystem unto itself, with organisms, bacteria, and germs plotting and scheming against you. Well… perhaps not to that extreme, but even a quality mattress is still very capable of harboring an assortment of organisms that can irritate, exacerbate, or cause allergies and be generally detrimental to your health. One of the biggest assailants to you and your mattresses is dust mites. Microscopic organisms that feed on the dead skin cells that make their way into the mattress, dust mite numbers grow quickly and are nearly impossible to remove from within a mattress. One of the favorite scare tactics of shadier members of the mattress industry is the claim that mattresses can double in weight over the course of a decade due to mites. This has never been scientifically backed, but that doesn’t mean numbers of mites don’t increase over time, and the more there are, the more serious their health impact can become. Mites don’t bite, but their waste and dead bodies form the irritants that affect us. When breathed, these can cause the symptoms we recognize as an allergic reaction. This can lead to stuffy and runny noses, watery, dry or itchy eyes, sneezing, and coughing. These symptoms are hard to singularly attribute to mites though, because they mimic that of the common cold and allergies from more common sources, like pollen. Dust mites can also increase symptoms in asthma sufferers. Moisture is another major enemy of new mattresses, making it your enemy as well. Moisture contained in a mattress can become a fertile breeding ground for mold, mildew, and bacteria; less-than-appealing things to be breathing in your sleep. These can spring from something as innocent as a spilled glass of water or a pet having an accident. Even the moisture your body naturally generates during the night can result in the growth of mildew, if given enough time in the right conditions. The summer months increase the potential for such growth, when we are more likely to perspire during the night, and increased humidity makes the drying of bedding more difficult. 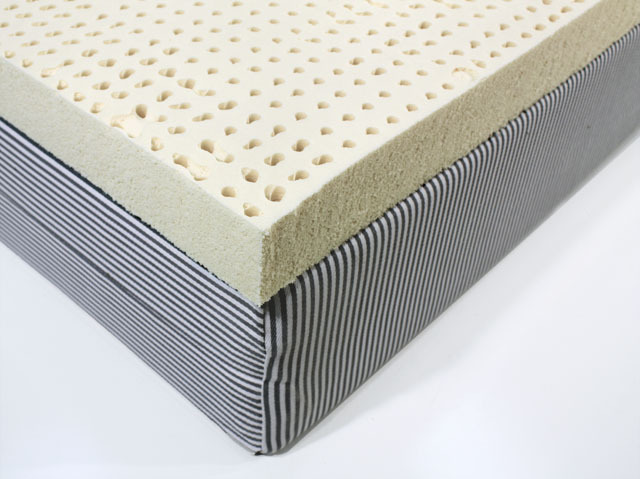 For individuals who suffer from severe allergy issues, an aerating and hypoallergenic latex mattress may prove to be helpful, and some varieties of memory foam are also hypoallergenic. Another very real possibility is an allergy to materials used in the construction of mattresses themselves. Cotton and wool allergies are far from unheard of, as are sensitivities to synthetics, but like dust mites, it is difficult to pinpoint your exact allergy due to the symptoms shared with common irritants. Seeing your doctor to identify your specific allergies is the only surefire way to know exactly what is causing your symptoms, but being armed with that knowledge can help you make the right decision when it comes to purchasing your next mattress.